Contact us for the most comprehensive range of laboratory sieves and sieve shakers in New Zealand. We keep commonly used aperture sizes in stock, in 200mm, 300mm and 450mm diameter sieves. Other diameters are also available: 100mm, half height, washing sieves, and special apertures. We are able to supply and support a complete range of sieve shakers from Endecotts, Controls, and Pascall (Inclyno). For sieving large volumes, using large diameter sieves (i.e. 300mm and 450mm dia) and dealing with heavy samples, we recommend the the Pascall Inclyno 3. The Pascall Inclyno sieve shakers are well known for their effective sieving action. These shakers use a combined gyratory and jolting action. With the table always inclined, the sample is constantly spread over the entire area of the sieves' mesh. The vertical jolting, at about 300 jolts per minute, ensures that samples break down and find apertures quickly. The Inclyno Model 3 is one of the few reputable sieve shakers known to be able to effectively sieve with large diameter sieves (e.g. 450mm dia.) and heavy samples. The new Endecotts Sieve Shaker EFL 300 combines the best features of the EFL2 whilst incorporating modern sieve shaker technology. 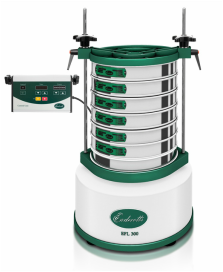 The EFL 300 is still extremely robust but at the same time lightweight and more powerful than its predecessor - heavier and larger samples can now be sieved. The sieve shaker EFL 300 is very versatile. Amplitude setting is now standard. The heavy electric motor is replaced by the electromagnetic system found in all modern sieve shakers. Its lighter form means that it can be either floor standing or even bench mounted making it suitable for both, laboratory and industrial environments. Sieving parameters are set by the remote control unit. Its functions are logical and very simple to operate. ¤ Takes 8 x 200mm or 6 x 300mm (plus pan and lid). The D411 uses a tapping action along with the vertical and rotating movement, giving a very efficient sieving action. This is a sieve shaker for people needing high volumes of tests done quickly. It has slanted threads on the tightening nuts: they can run freely up and down the threaded rod but tighten against the clamp. Slanted threads on the tightening nuts let them run freely up and down the threaded rod but tighten against the clamp. The sieve holders at top and bottom have rubber retainers and the clasps adjust for any size of sieve and for centering. Lightweight, budget, portable and small sieve shakers.